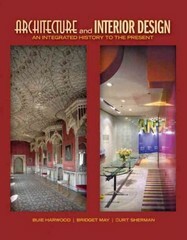 Architecture and Interior Design 1 Edition Architecture and Interior Design: An Integrated History to the Present provides a survey of architecture, interiors, furniture, and decorative arts from the past to the present. It is a completely integrated and interdisciplinary reference for: architecture, architectural details, architectural surface treatments, space planning, interior design, interior architectural features, interior surface treatments, motifs, furniture, color, lighting, textiles, and decorative accessories. The unique scope allows comparison in all areas of the built environment through the centuries to illustrate historical, social, cultural, and stylistic influences. Narrative and graphics interweave design analysis with architectural and design history.